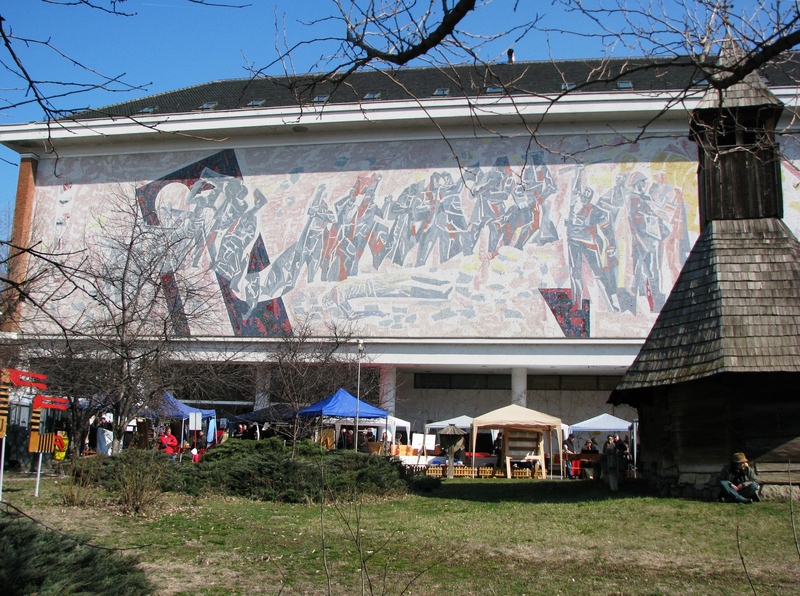 The building, originally destined to house the Romanian Peasant Museum, was used since 1952 as a Lenin-Stalin museum, and then as a History of Communism in Romania museum. A rear wing was added in the 1960s to the main body of the edifice. After the collapse of the communist regime in 1989, the collections of the ethnographic museum returned to their rightful place. 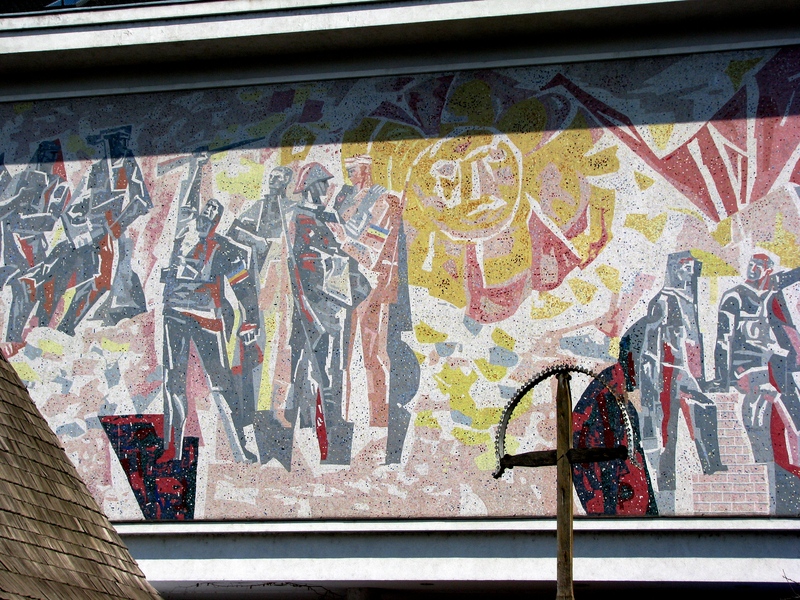 The large mosaic covering the entire rear wall of the building is a remarkable and unique in Bucharest work in the characteristic “proletkultist” (proletarian culture) style, rendering typical themes such as the glorification of the working class. 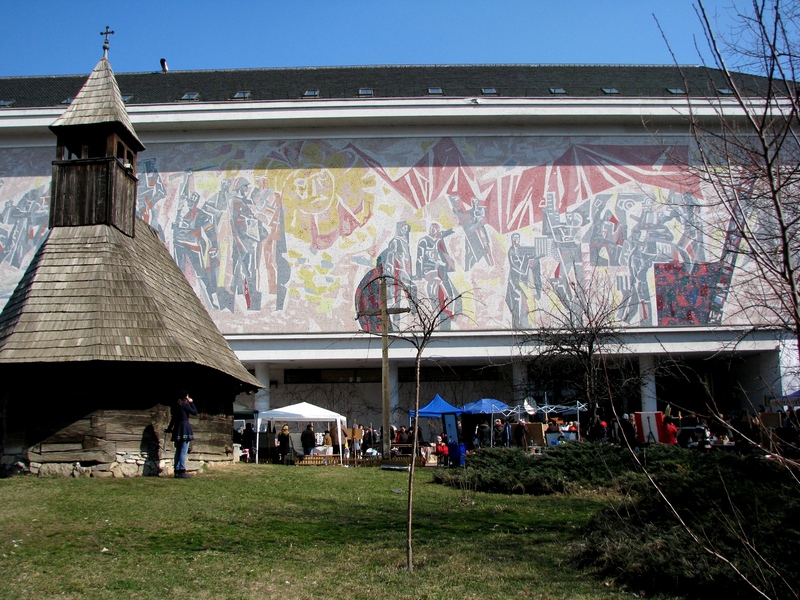 The mosaic creates a striking contrast with the old wooden church, which was put up after the recommissioning of the Romanian Peasant Museum according to its intended purpose. In the basement of the Peasant Museums was set up the “Red Plague – Political Installation”, the only permanent exhibition in Bucharest dedicated to the communist past, gathering some objects formerly belonging to the dismantled Communist museum, along with newspaper extracts and a room with political cartoons recalling the collectivization period. The Peasant Museum is part of my private guided tour “Communist Bucharest Tour”. If interested in taking this tour and learning more about the communist past of Bucharest, please contact me.